Manchester Thunder hope to make the Manchester Arena their permanent home, says head coach Tracey Neville. 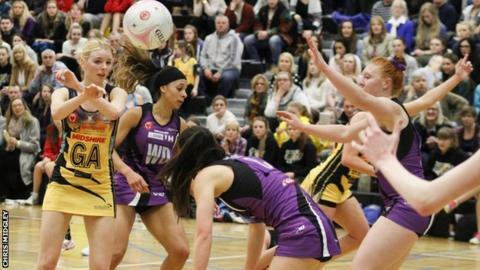 Thunder attracted a club-record crowd of over 4,000 at the venue as they lost to Hertfordshire Mavericks in the Superleague semi-final on Saturday. The 2014 champions, who had been unbeaten before that defeat, currently play at Wright Robinson Sports College. "This event was unreal. I was so surprised and honoured to be part of it," Neville told BBC Sport. "I hope this is where netballing is evolving and this is our home venue for the rest of our lives. "I think it will take an long time to evolve, but I think next year Manchester Thunder could put on two events like this and we'll just build it up."